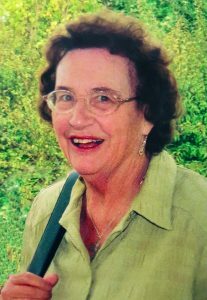 During the 1980s, Rosaleen became involved in the life of the Marist Messenger. Her love of words and grammar prompted her to offer to proof read the monthly galley proofs before the final printing. I think she had got tired of the regular typos that were part of the magazine. She not only read each article from start to finish but she then read it from finish to start. She always said you picked up further errors by reading backwards. Around the same time, she commenced a regular column titled “Saint of the Month”. This feature continued for some years until February 1992. St Thomas More, the father of three daughters, insisted that girls needed an education. She referred to St Joseph as an Israeli refugee and managed to turn him into a multi patron of: families, unemployment, courtships, driving lessons, overdrawn bank accounts, immigrants and refugees. St Mary Magdalene was the patron saint of women’s support groups, she worked alongside men before unisex was fashionable. Rosaleen saw St Philip Neri as “a bloke for a joke”, who told his friends to preach lightheartedly and to crack a joke. Philip and his Roman mates got a name for fun. St David of Wales would sit comfortably with present day governments. Rosaleen told us he saw the need of conserving farming water by devising irrigation systems. Rosaleen’s love of the Irish is present in much of her writing. Writing about St Brigid of Ireland, Rosaleen said her behaviour is typical of things Irish. She gave everything away, whether the items were hers or not. She danced and laughed and did outrageous things but got away with them because she was blonde and pretty . I love Rosaleen’s St Albert whom she states was no square although she attributes the recipe for ‘Albert Square’ to him, claiming that he devised it in the 13th century, being one of the few recipes that have currants as the sole fruit. 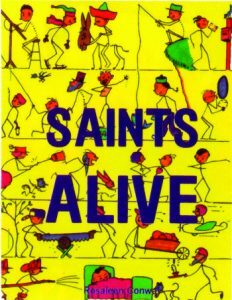 The regular monthly feature turned into a small book titled Saints Alive. The book contained a number of the favourite saints stories culled from the pages of the Marist Messenger. It soon became a popular seller resulting in several reprints as readers purchased them as gifts for the younger generations of their families. In October 1984 Rosaleen won an award sponsored by the Tourism and Publicity Department. There were five categories and Rosaleen won none of them. However, the judge, Australian Colleen McCullough, suggested an extra award for Rosaleen’s article on Wellington. The passing of Rosaleen sees the departure of a saint from the lives of her family and her many friends. May she enjoy the company of the saints whom she has loved so dearly.